This is not an airport, iOS 6.
iOS 6’s Maps is the biggest criticism of Apple’s new mobile operating system. In short, it’s clearly years behind Google Maps, which previously powered Maps in past versions of iOS. Most of the time, complaints about Apple’s new Maps accuse the latter of being under-developed and unreliable compared to Google Maps, but the Irish government has a different concern: they are worried that iOS 6 Maps will result in pilots crashing their airplanes directly into a park. Here’s the issue. In Dundrum, County Dublin, there’s a park called Airfield Park, which is despite its name home to a city farm, some gardens, a cafe and more. It’s a common recreational spot for the neighborhood, spread across 35-acres. 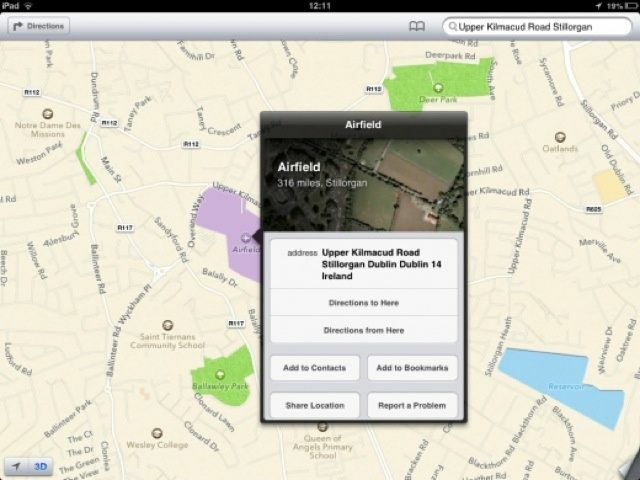 The problem is that in iOS 6 Maps, Apple has labeled Airfield Park as an actual airport, complete with an Airport icon. It’s an obvious human error, but it’s got at least one Irish politican concerned that a pilot might try to use his iPhone or iPad to land smack dabble in the middle of the Park. The Minister for Justice Alan Shatter is to contact Apple over concerns that Airfield in Dundrum in Dublin has been designated with the image of an airport on its new ‘map app’. Minister Shatter says the designation is dangerously misleading and could lead to a pilot who’s unfamiliar with the area, attempting a landing there in an emergency situation. He has called on the makers of the iPhone to urgently correct the image and has suggested a variety of alternative images for Airfield House such as a cow, a goat, a sheep or a flower. As a citizen of Ireland and a man whom, like many of his countrymen, stumbles around dangerously drunk almost all of the time, this fear probably isn’t as absurd as it first appears. The impact on good sense that one too many pints of Guinness can have is legendary; if I once went home with horrid old Dearbhla O’Donnell after my fifth pint against all of my better sense and sanity, it’s easy for me to imagine a soused Irish pilot landing his plane one-handed in Dundrum based off of what his iPhone told him. On a serious note, it’s worth mentioning the fact that Google Maps is a very mature, world-class platform, and it’s going to take Apple time to catch up to them. Still, this has got to sting for Apple: they are used to releasing the best experience possible when they enter a new market, and with Maps, they’ve done just the opposite.